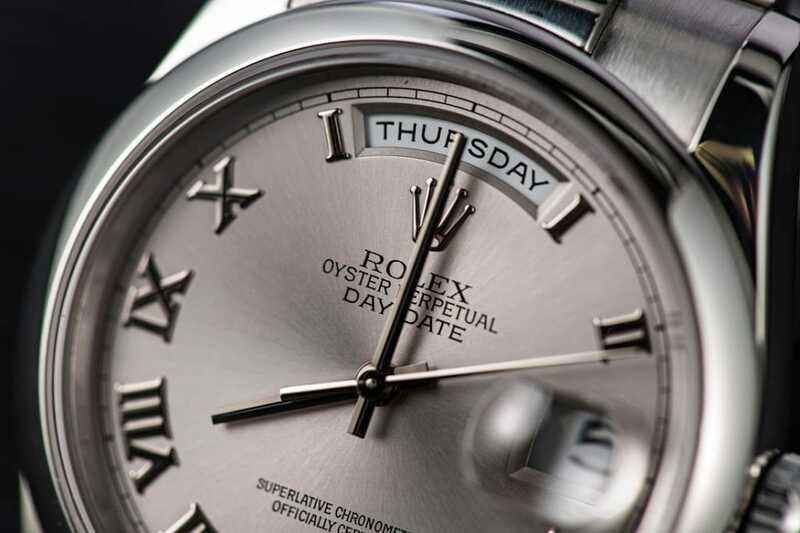 When first unveiled in 1956, the Rolex Oyster Perpetual Day-Date was the first wristwatch to show both the day of the week written in full, in addition to the month of the year, hence its name. Along with the watch, was the debut of the “President” bracelet, sporting the semi-circular three-piece links, that has now become iconic in its own right. The name of the bracelet, along with the fondness of the Day-Date among American presidents and global leaders, has led to the watch’s accepted nickname – The Presidents’ Watch. Rolex President 18206 is a true luxury piece. 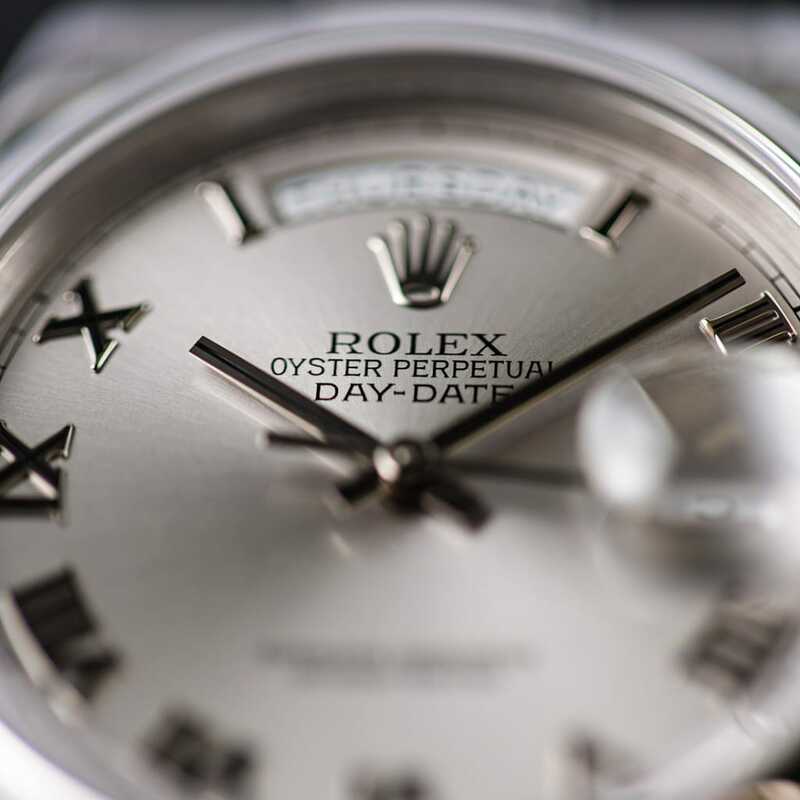 Exclusively crafted in either 18k gold or 950 platinum, the Day-Date is the definitive Rolex luxury timepiece. A vast array of dial options is available within the collection from color choices to different materials, hour markers styles, and the possibility of diamonds, to configure a timepiece perfectly suited to one’s aesthetics. And since last year’s Baselworld, two size options are available including the traditional 36mm and the newer 40mm sized case. Rolex Day Date 18206 is simple, but it also fits in sophisticated places. 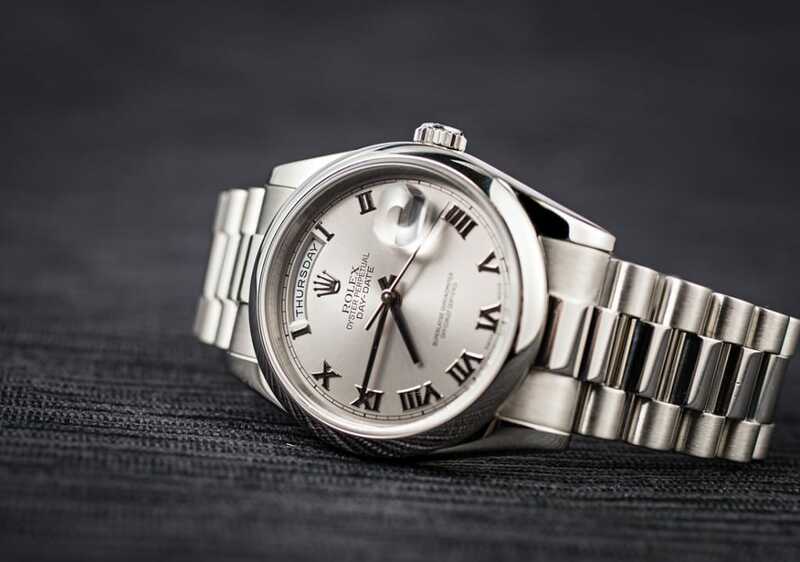 This particular Day-Date 118206 is part of Rolex’s current collection of Presidents’ watches and is manufactured in full platinum for the ultimate in understated lavishness. The President 118206’s round 36mm platinum Oyster case is topped with a smooth domed bezel and is equipped with a screw-down crown to ensure waterproofness to 330 feet (1,000 meters). Although originally created as a gent’s watch, its restrained size means that it is perfectly suited for a ladies’ wrist as well. In fact, wearing a gent’s Day-Date is a favorite among female celebrities including Sharon Stone, Jennifer Aniston, and Chiara Ferragni, and a quick glance at Instagram will show you a plethora of stylish fashionistas rocking the watch. Rolex President 18206 can also be worn on a lady. The silver colored dial matches the platinum metal perfectly and gives the watch a sleek monochromatic look. For a classic touch, the hour markers on the dial are Roman numerals except at 3 o’clock and 12 o’clock to make way for the date and day apertures. Naturally, the sapphire crystal is affixed with the Cyclops lens above the date window for better magnification. Driving the day, date, and center hands functions is the Rolex Caliber 3155 automatic mechanical movement for unwavering time and calendar precision and reliability. 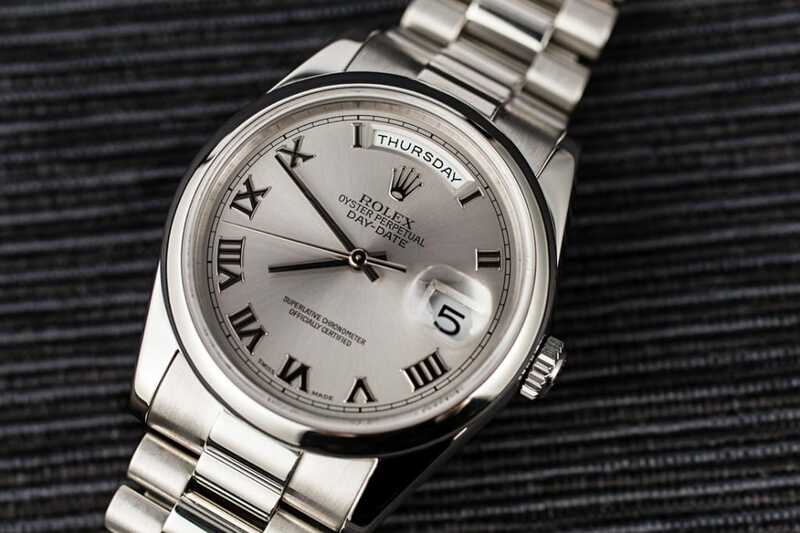 Rolex Day Date President 18206 has a sapphire crystal. 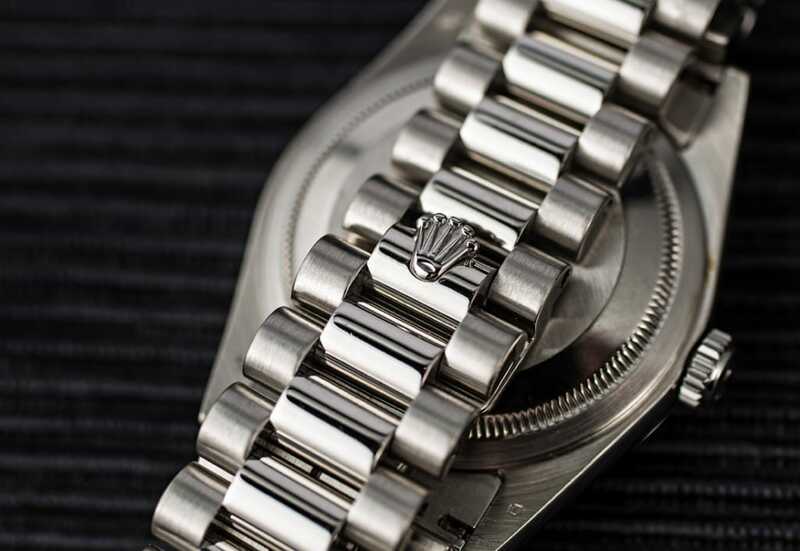 The shape of the President bracelet is instantaneously recognizable thanks to the semi-circular shape of the links, and on this Day-Date 118206, it is exquisitely fashioned in platinum for unparalleled prestige. Finishing off the elegant and comfortable bracelet is the hidden Crownclasp beneath the brand’s coronet symbol. Rolex President 18206 has a typical bracelet for a president. 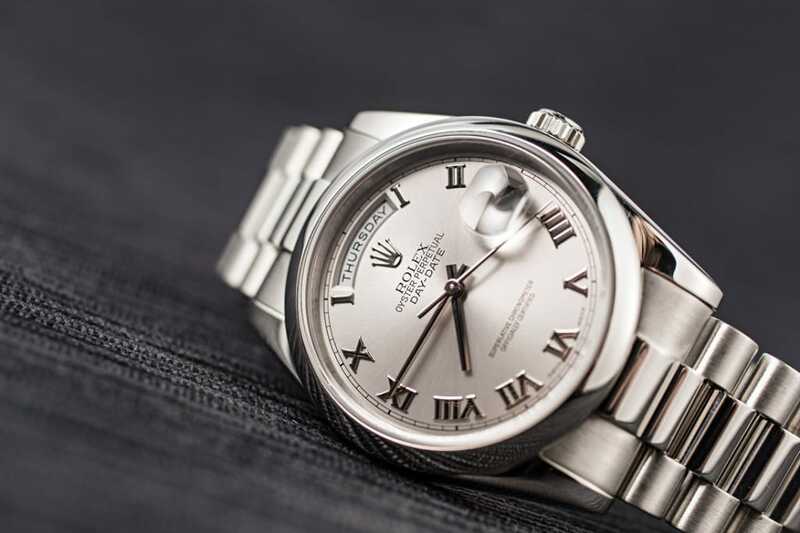 Coveted by many, yet owned by only a discerning few, the Day-Date 118206 platinum edition is a very fine example of how beautiful the classic Rolex watch can be. Rolex President Ref No 18206 is rare, classy. and beautiful.